Leo Touchet’s earliest memory of photography was at the age of six in his hometown of Abbeville, Louisiana when an uncle returned from World War II with boxes of photographs he had taken, and he has since wanted to travel. While in high school, he was selected to be the school photographer. His equipment then was an old 4x5 Crown Graphic Camera with screw in flash bulbs. After high school and a stint in the Army, he enrolled in Architecture school at the University of Southwest Louisiana (now the University of Louisiana Lafayette). There he was introduced to composition, form, light and perspective. His photography has since used all of these elements. Most of his photos are full-frame images, cropped in the camera. He later worked in Cleveland and New York as a draftsman and later as an industrial designer. Eventually he became bored with working in an office on a drawing board. In July 1965, on a visit to the Museum of Modem Art (MOMA), he was captivated by the photos of Henri Cartier-Bresson. The next day, he bought a used Leica M2 camera and began photographing on the streets of New York. The photography archives at MOMA were open to the public and most of his photography education resulted from his many hours studying photos of Cartier-Bresson, Paul Strand, Eugene Smith, Edward Steichen, Gordon Parks and many other photographers in the collection. Later that year, he bought a ticket to Vietnam to become a photographer. 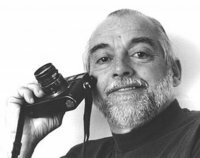 Over the last 50 years, he has worked for numerous national and international publications, traveling to over 50 countries around the world. Following are some of the places where his photographs have been displayed.